A model whose botched surgery led to the amputation of her GANGRENOUS LEG has fulfilled her dreams of walking a national fashion runway with her prosthetic. Rosalina Oktavia, 27, had her lower limb removed after an operation to correct a torn-tendon went horribly wrong, severing one of her arteries and left her in agony as her skin rotted away. Her ‘world fell apart’ after the amputation in Indonesia, three-years-ago, as she feared she would never model again and regularly felt like an outcast due to constant sympathetic stares from strangers. She moved to Hougang, Singapore, last year after marrying partner Don Kasunjith, 30, together they decided to take some modelling shots to try breaking the stigmatised perception of disability. Rosalina was photographed on sports, elegant and lingerie shoots, before being asked to walk the catwalk as part of Singapore Fashion Runway three-months-ago. Now she’s determined to encourage others to not be held back by their differences or disabilities and has become an ambassador for charity Models of Diversity. Rosalina, a clinic assistant, said: “Modelling helped me to love my body and accept who I am. I know it gives other amputees hope and courage too. 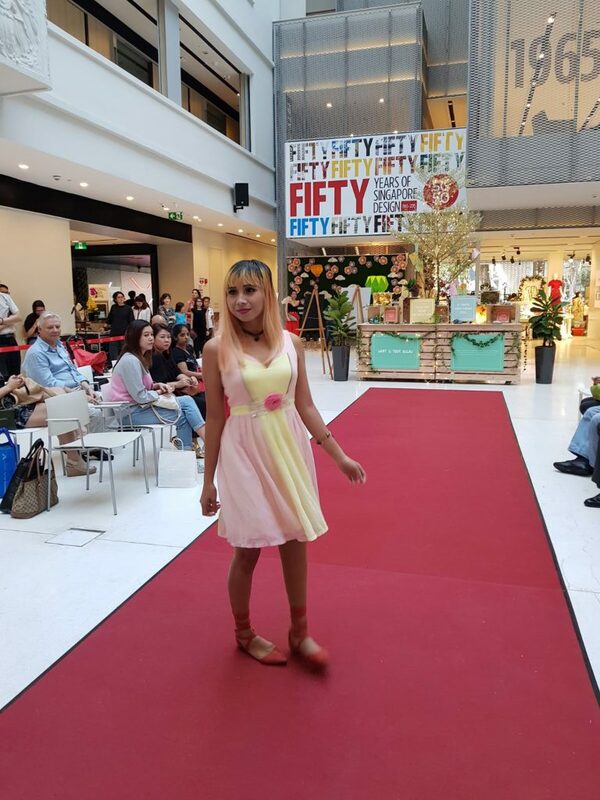 “Walking for the Singapore Fashion Runway was really my dream coming true, and I never thought I would be able to do it with one leg. “Although it was my first time, I was not nervous about the large audience. My worry was the prosthetic leg, I really had to focus on my walking pace in order to not to miss my steps. “If you set your mind to do something, go for it. Do not let others distract you. Don’t let other’s opinion affect you. “Most importantly don’t let your differences or disabilities define who you are. “Since walking on the runway, I feel that I have done something good for the world. “I remember how I felt right after the amputation, my whole world fell apart, no one should go through that trauma. Rosalina was unaware that the surgery to repair her damaged tendons, caused by a motorcycle accident in 2010, could ever lead her to losing her limb. She was able to walk prior to the surgery three-years-ago, but hoped the op would allow her to run and partake in activities that required greater physical exertion. Rosalina, who used to be a midwife, claims she knew there was a problem during her operation – the ramifications of which, would change her life forever. She said: “I could see the doctor’s confusion and nervousness and there was a lot of blood gushing out. “I asked what happened and if everything was alright. He told me everything was okay. “After the surgery, my knee was swollen more than the double its usual size and it didn’t disappear even after five days. “Later, the same doctor who performed the surgery came down again with a single nurse and did another procedure where he cut open both sides of my leg below the knee. “He said it was a way to bring down the swelling. Little I did know that he was going to leave the wound open without closing it. There was only a bandage covering these openings. “I was transferred to a bigger hospital by ambulance and the second doctor who attended to me there was so surprised to see two cuts on my leg and believed it was very unnecessary. Surgeons tried to repair the severed artery on her left leg by transplanting a blood vessel from the other limb, but it didn’t work. The area had been without a bloody supply for so long that gangrene had developed, which caused the tissue to die, turn a blackish colour and begin to break down. Rosalina said: “They tried to remove gangrene by scraping it off, attempting a few times until the bone appeared in some places. Finally, they asked my permission to amputate the leg. She spent four months relearning how to walk after losing her lower-limb but in public often felt embarrassed by the public’s intrigue in her prosthetic. Later Rosalina after moving to Singapore, where she decided she didn’t want to hide any longer and that she would proudly show her limb difference. Determined to overturn the view that if you have a disability your ‘life is over’ and that people with them should ‘hide in the shadows’ – she revealed her prosthetic proudly and even restarted modelling. Rosalina said: “In Singapore, I wasn’t subjected to constant staring, but people would approach and ask me what happened. I always prefer if someone asks me instead of staring at me. “I was looking at amputee models from USA and Europe online, and thought why I can’t be strong enough to show the world the beauty in me, just like they do. “So my husband, who is a photographer, and I slowly built up a modelling portfolio for me, we wanted to break the taboo and do something about it. After walking for Singapore Fashion Runway, she has since become an ambassador for the even and Models of Diversity (MOD). Founded by Angel Sinclair, MOD is a charity who advocate and support the use of diverse models in the fashion and beauty industries. Angel said: “What struck me about Roza was her enthusiasm to bring about change around the approach to disability in Singapore. “By working with a number of photographers and producing such amazing imagery has certainly be captivating. “We at MOD get inundated with request from people all around the world, needing our help, but we are limited to what we can do. “As we are approaching LFW I am delighted to hear Designer Teatum Jones will be using Disabled Model Kelly Knox. Rosalina credits the support of Eileen Yap, the found of Singapore Fashion Runway: Fashion for a Social Cause. As well as her prosthetist Desmond Lim and her husband, for enabling her to take on the challenges so far.